The new Field Master cultivation equipment is the latest machine from Grizzly Engineering . The 2.5 metre transport width of the Field Master cultivation equipment allows transport through narrow gates and roads while the hydraulic gang shift provides smooth, reliable and easy transport to working position. Grizzly Engineering have maintained the use of it's tried, tested and proven running gear with the cultivation equipment. 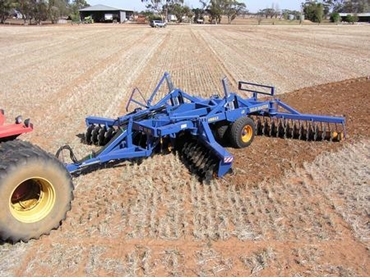 However, adding the hydraulic gang shift makes this the ideal farm machinery for farmers on the move. Additionally, the Field Master cultivation equipment is suitable for contractors that require a fast transition from transport to working position and back again in seconds without having to get out of the tractor. The Grizzly Field Master provides a solution to all those cultivation problems.